3. Receive presentation from Joe Minicozzi with Urban3 regarding an economic impact analysis of the Northline project. 4. Open Meeting, Invocation and Pledges of Allegiance. 7. Citizen Comments: Three (3) minutes allowed per speaker. 9. Approval of the minutes for meeting held on May 17, 2018. 10. Approval of Second Reading of an Ordinance regarding Ordinance Case 18-OR-001 to amend the Composite Zoning Ordinance to amend Article VI, Section 14 (a) regarding dumpster enclosures, and to provide for related matters; Williamson & Travis Counties, Texas. 11. Approval of Second Reading of an Ordinance regarding Special Use Permit Case 18-SU-004 to allow for the expansion of the parts and steel fabrication business; storage, sale, and repair/restoration of classic cars; adding base material and/or gravel for parts storage; and add additional metal wall enclosures to building on one (1) parcel of land approximately 4 acres ± in size, more particularly described by Williamson Central Appraisal District Parcel R031255; and addressed as 9800 RM 2243; generally located to the northwest of the intersection of 183A Toll and RM 2243, Leander, Williamson County, Texas. 12. Approval of Second Reading of an Ordinance regarding Special Use Permit Case 18-SU-005 to allow for a dog daycare and boarding facility; and a food truck bar and patio on one (1) parcel of land approximately 4.98 acres ± in size, more particularly described by Williamson Central Appraisal District Parcel R023957; and addressed as 4411 Oak Creek Road; generally located to the northeast of the intersection of CR 279 and Oak Creek Road, Leander, Williamson County, Texas. 13. Approval of Second Reading of an Ordinance regarding Zoning Case 18-Z-008 to amend the current zoning of LC-2-B (Local Commercial) to PUD (Planned Unit Development) with a base zoning district of LC-2-A (Local Commercial) on one (1) parcel of land approximately 7.803 acres ± in size, more particularly described by Williamson Central Appraisal District Parcel R032156; and generally located to the southeast of the intersection of Lakeline Boulevard and Sauterne Drive, Leander, Williamson County, Texas. 14. Approval of Dedication and Acceptance of Subdivision Infrastructure Improvements for The Village at Leander Station, Phases 1, 2 & 3. 15. Approval of the Ishav Properties Development Agreement Case 18-DA-001 regarding the approval of a Development Agreement regarding the platting process; located at 601 S. US 183; generally located 600 feet to the north of the intersection of Sonny Drive and S. US 183 on the west side of S. US 183, Williamson County, Texas. 16. Approval for the official naming of three (3) parks: Lakewood Park, Mason Creek Greenway and Leander Commons. 17. Approval of road closures for Liberty Fest on July 4, 2018. 18. Conduct a Public Hearing and consider action regarding Comprehensive Plan Amendment Case 18-CPA-002 to amend the Transportation Plan as set forth in the Comprehensive Plan; Williamson & Travis Counties, Texas. Discuss and consider action on the First Reading of an Ordinance regarding Comprehensive Plan Amendment Case 18-CPA-002 to amend the Transportation Plan as set forth in the Comprehensive Plan; Williamson & Travis Counties, Texas. 19. Conduct a Public Hearing and consider action regarding Zoning Case 18-TOD-Z-012 and Subdivision Case 18-TOD-CP-004 to amend the current zoning of PUD/TOD (Planned Unit Development/Transit Oriented Development) within the S1 General Sector and S2 Station Sector to change the sector to S2 Station Sector for the entire property and designate the T4 General Urban Zone T5 Urban Center Zone, and T6 Urban Core Zone with modifications to certain standards in the Leander SmartCode; and to approve the Northline Concept Plan on four (4) parcels of land approximately 115.7076 acres ± in size, more particularly described by Williamson Central Appraisal District Parcels R458187, R517094, R031604, and R457677; and generally located to the southwest of the intersection of 183A Toll Road and San Gabriel Parkway; Leander, Williamson County, Texas. Discuss and consider action on the First Reading of an Ordinance regarding regarding Zoning Case 18-TOD-Z-012 and Subdivision Case 18-TOD-CP-004 to amend the current zoning of PUD/TOD (Planned Unit Development/Transit Oriented Development) within the S1 General Sector and S2 Station Sector to change the sector to S2 Station Sector for the entire property and designate the T4 General Urban Zone T5 Urban Center Zone, and T6 Urban Core Zone with modifications to certain standards in the Leander SmartCode; and to approve the Northline Concept Plan on four (4) parcels of land approximately 115.7076 acres ± in size, more particularly described by Williamson Central Appraisal District Parcels R458187, R517094, R031604, and R457677; and generally located to the southwest of the intersection of 183A Toll Road and San Gabriel Parkway; Leander, Williamson County, Texas. Discuss and consider action on the First Reading of an Ordinance regarding Zoning Case 18-Z-010 and Subdivision Case 18-CP-003 to amend the current zoning of Interim SFR-1-B to PUD (Planned Unit Development) with the base zoning districts of SFT-2-A (Single-Family Townhouse), SFL-2-A (Single-Family Limited), and LC-2-A (Local Commercial) and to approve the Simpson Tract Concept Plan on three (3) parcels of land approximately 69.1 acres ± in size, more particularly described by Williamson Central Appraisal District Parcels R031570, R031573 and R031574; and generally located to the southwest of the intersection of Journey Parkway and CR 175, Leander, Williamson County, Texas. 21. Receive quarterly General Obligations (GO) Bond update. 22. Discuss and consider a Resolution establishing the Northline PUD Neighborhood Empowerment Zone; providing effective date and Open Meetings clauses; and providing for related matters. Discuss and consider an Ordinance amending Article 1.09 of the Code of Ordinances to establish the Northline PUD Development Incentives Program; providing effective date and Open Meetings clauses; and providing for related matters. Discuss and consider a Development Agreement by and between the City of Leander and the Northline PUD; and providing for related matters. 23. Discuss and consider entering into an Interlocal Agreement with LCRA for the Ridgmar Electric Substation. 24. Discuss and consider Amendment 3 to Task Order FNI-3 with Freese and Nichols, Inc., for design, bidding, and construction phase Professional Services for the San Gabriel Parkway Roadway Project in the amount of Two Hundred Ninety-Eight Thousand Eight Hundred Thirty-Two ($298,832.00) Dollars; and authorizing the City Manager to execute any and all necessary documents. 25. Discuss and consider authorizing the purchase of forty-five (45) replacement radios for the Leander Police Department and forty-five (45) replacement radios the Leander Fire Department for a total of ninety (90) radios from Motorola, Inc. through Houston Galveston Area Council (H-GAC) cooperative purchasing in the amount of Five Hundred Seven Thousand Six Hundred Forty-Five Dollars and Twenty-Two Cents ($507,645.22); and authorizing the City Manager to execute any and all necessary documents. 26. Discuss and consider the annual appointment of the Tax Increment Reinvestment Zone (TIRZ) No. 1 Board Chair for a term ending December 31, 2018. 27. Discuss and consider appointment of Council Liaison to the Public Art Commission. 28. Council Member Closing Statements. 29. Convene into Executive Session pursuant to (a) Section 551.087, Texas Local Government Code, to discuss or deliberate proposed economic development incentives for a business prospect that the governmental body seeks to have locate, stay, or expand in or near the territory of the governmental body and with which the governmental body is conducting economic development negotiations; and (b) Section 551.071, Texas Government Code, and Section 1.05, Texas Disciplinary Rules of Professional Conduct, to receive advice from legal counsel regarding the Open Meetings Act. 30. Reconvene into open session to take any action as deemed appropriate in the City Council's discretion regarding the Executive Session. This meeting will be conducted pursuant to the Texas Government Code Section 55 1.001 et seq. At any time during the meeting the Council reserves the right to adjourn into Executive Session on any of the above posted agenda items in accordance with the Sections 55 1.071 [litigation and certain Consultation with attorney]. 551.072 [acquisition of interest in real property], 55 1.073 [prospective gift to city], 55 1.074 [certain personnel deliberations] or 551.076 [deployment/implementation of security personnel or devices]. 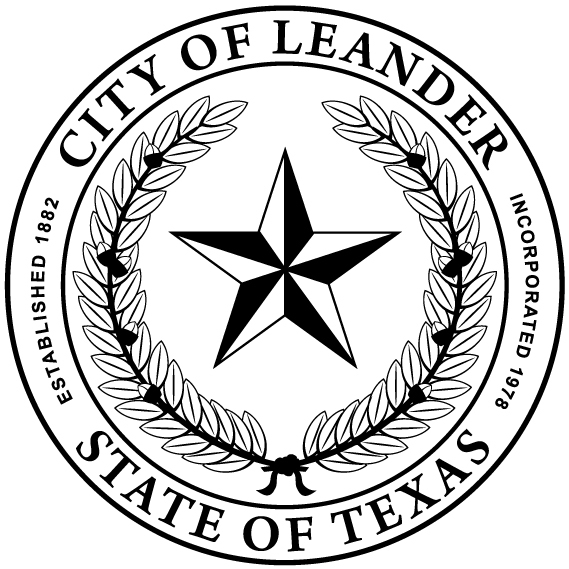 The City of Leander is committed to compliance with the American with Disabilities Act. Reasonable modifications and equal access to communications will be provided upon request. Please call the City Secretary at (512) 528-2743 for information. Hearing impaired or speech disabled persons equipped with telecommunication devices for the deaf may call (512) 528-2800. I certify that the above agenda for this meeting of the City Council of the City of Leander, Texas. was posted on the bulletin board at City Hall in Leander. Texas on the 4 day of June 2018 by 5:00 pm pursuant to Chapter 551 of the Texas Government Code.